The first version of this paper was written in 2003 and the results were used for a New York Times article on May 4, 2003 titled “So How Much Is That . . . . . . . . Worth?” The paper was presented at several U.S. economic forums during 2003 and 2004 including The American Real Estate and Urban Economics Association Annual Meeting in San Diego, The American Bar Association in New York, The New York University School of Law Faculty Workshop and The American Real Estate Society Annual Meeting in Monterey, California, all to good reviews. After peer review, the paper was updated. The 15.5% premium in the original research was modified to 8.8% in the 7/23/2006 version and submitted for final approval to the Journal of Legal Studies where it was published in the August 2007 issue. One of the enduring puzzles of New York City's housing market is the persistence of the housing cooperative, despite the prevailing wisdom that condominiums are more valuable than cooperatives. In this article, we examine the theoretical advantages and disadvantages of cooperatives and condominiums, and apply these theoretical insights to empirically test whether there is a price premium attributable to condominium housing. 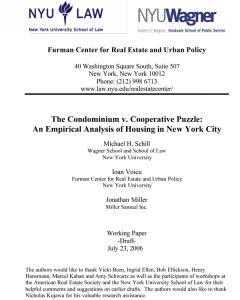 We then use our findings to speculate as to why the cooperative form remains dominant in New York City and whether its dominance is likely to continue in the future. The empirical analysis is based on hedonic models of house values and uses rich data on apartments sold in New York City between 1984 and 2002. In most instances, theory suggests several reasons why the condominium may be a more efficient and desirable housing form than the cooperative. Unlike the case of cooperatives, condominium owners do not share liability on mortgage debt, they are free to transfer their apartments to whomever they choose, they are subject to fewer rules than cooperative apartment owners and, correspondingly, they need spend less time in internal governance. Our empirical findings confirm the theoretical prediction that legal form does indeed matter. With one important exception, condominium apartments are significantly more valuable than comparable cooperative apartments. The one exception suggests that for some owners, the benefits of restriction and exclusivity that the cooperative form offers, and which until recently seemed to be impossible to achieve through the condominium form, may be utility-maximizing. We speculate that, except for the segment of the market that seeks a socially exclusive residential environment, the continued dominance of cooperative housing in New York City is probably attributable to transaction costs and collective action problems which make switching to condominium form potentially difficult.